Please join us at TweetChat this Wednesday, May 16, at 9 a.m. CDT (10 eastern, 7 pacific) when Anne will interview Promo Day organizer Jo Linsdell in a tweetchat. 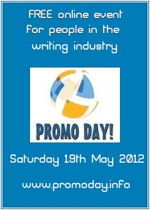 They’ll be discussing Promo Day, a free online event this Saturday, May 19, designed to help writers (and all creative people) learn how to promote their work. NOTE: Both Anne and Jo will make presentations at Promo Day, along with several other experts in the writing and marketing fields. Anne will be talking about how to use astrology for time management, and Jo will be talking about how to make LinkedIn work for you. Follow the discussion this Wednesday: go to the TweetChat site and enter PD12 in the box at the top to sign in. To join in, just tweet a question or comment.